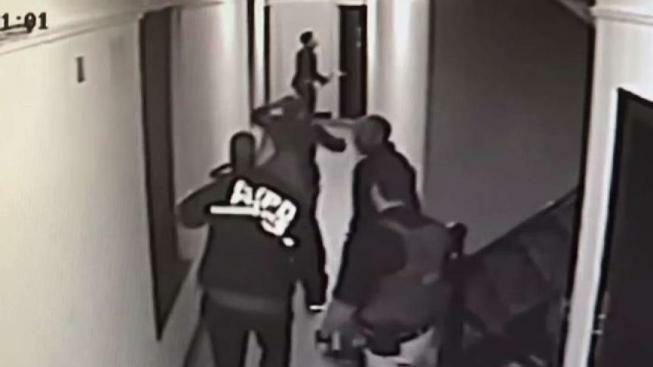 Surveillance video shows an FBI raid in the arrest of Wilfredo Encarnacion. Prosecutors said he spoke to an FBI undercover about his alleged plans to join the terror group Lashkar e-Tayyiba, which is believed responsible for several major terror plots including the 2008 Mumbai attacks. A Manhattan man was arrested Thursday as tried to get on a plane to fly overseas, allegedly to Pakistan to join and train with a terror group, prosecutors said. The FBI and NYPD arrested Wilfredo Encarnacion, 29, at JFK Airport. Prosecutors said he spoke to an FBI undercover about his alleged plans to join the terror group Lashkar e-Tayyiba, which is believed responsible for several major terror plots including the 2008 Mumbai attacks. "Not only did Mr. Encarnacion express a desire to execute and behead people, he scheduled travel and almost boarded a plane so he could go learn how to become a terrorist," said FBI New York Director William Sweeney. Investigators said the suspect did not yet have weapons or training, but repeatedly spoke about how "I want to execute. I want to behead. Shoot." Encarnacion allegedly called himself "lionofthegood" and "jihadinheart" online. He allegedly wrote a message on a jihadist forum on Nov. 1, 2018: "I want to fight till death alongside the Islamic State...I’m a lone wolf looking for a family I can strike the crusaders ... I want to be part of a family willing to kill not afraid of death." On. Nov. 6, he allegedly wrote: "I want to join a group like isis, al wards or Taliban. I just don’t have connections. I want to learn. Fight. Kill. Die. And go to paradise." A Dallas, Texas man was also charged Friday. Michael Kyle Sewell, 18, was allegedly encouraging Encarnacion to travel overseas and joing the terror group. Both Sewell and Encarnacion are charged with material support for terror charges.